Please Vote for Us for the Mission Main Street Grant! 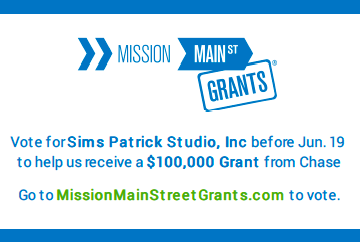 Sims Patrick Studio has the honor of applying for this special grant through Chase. Mission Main Street Grants is a grant program by Chase to award twenty (20) small businesses with grants of $100,000 to help grow their business. We are super excited but need your help! We need 250 votes by June 19th in order to finish our qualification process. Please note that a Facebook account is required for voting. Voters must have an active Facebook account to authenticate their Votes. To vote for us, please click here. Then type in Sims Patrick Studio to pull up our business for voting. It only takes a second!